Las Vegas is known for prizefights. So it was fitting that after a sluggish first few rounds, Hillary Clinton waded in with tactical precision in Wednesday's final presidential debate, while Fox News' Chris Wallace distinguished himself as a first-class referee. That leaves Clinton's opponent, Donald Trump. Through the first third, he engaged in a straightforward policy debate, with Wallace doing an admirable job of keeping the conversation on track, through substantive exchanges about tax policy, abortion and immigration. But then like a cornered fighter who begins punching wildly, Trump -- seemingly triggered by Clinton's jab about him being a "puppet" of Russian leader Vladimir Putin -- appeared to lose his cool. At times Wallace struggled to rein him in -- with Trump openly arguing with one question before the moderator could finish it -- and Trump's hostility looked as if it derailed his fight plan, leading Trump to again start interrupting and fuming during Clinton's answers. Politically, the obvious passage that will echo beyond the debate was Trump's unwillingness to say that he will accept the results of the election, amid his comments about the process being "rigged" during the run-up to the debate. But there were other moments that simply played badly as a matter of style, especially near the end when Clinton alluded to Trump not paying taxes, and he muttered, "Such a nasty woman." That followed Trump referring to her campaign as "sleazy" and "crooked." Trump experienced a bit of an embarrassment at the hands of the audience as well, when the subject of his behavior toward women arose. When the candidate repeated a line he has used before, "Nobody has more respect for women than I do," it elicited laughter, despite Wallace's admonishments for the crowd to remain silent. Trump also inadvertently fed the perception that Clinton was getting under his skin when he deviated to talk about watching TV that afternoon, and seeing all the attack ads she was running against him. It's not the first time the candidate has been riled by watching television -- in this case, at a time when one might think he'd be getting his game face on. Both candidates changed the subject at times in response to uncomfortable questions, a tactic Wallace occasionally allowed. But he generally lived up to the boxing referee analogy -- letting the two trade blows as much as possible, and doing what he could to break things up when one (usually Trump) insisted on hitting after the bell. Too much has been made of Wallace being the first Fox News anchor to moderate a presidential debate, given the network's significant role in the primaries. But after the year Fox has endured thanks to the scandal surrounding former CEO Roger Ailes, Wallace's steady performance should provide its personnel with a morale boost nevertheless. 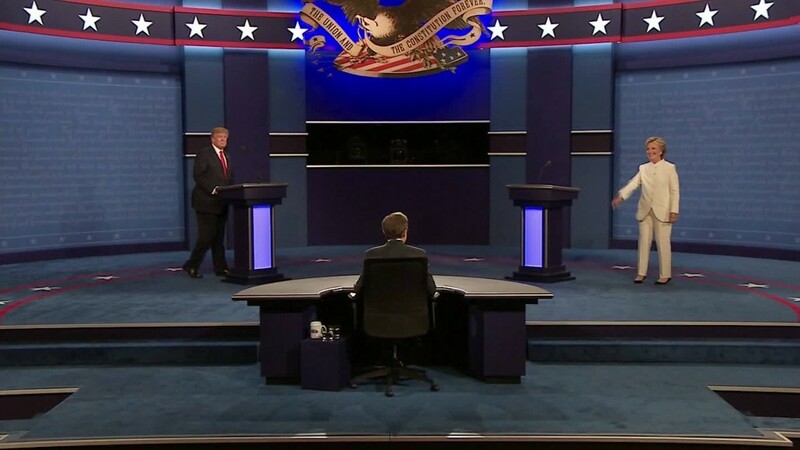 Strictly as a viewer, it was hard to escape a feeling that Clinton had plotted out an arc that the debate followed: jabbing at Trump in a manner that made him more reckless as the evening wore on, while she sought to continue looking presidential -- acting as if he'd never laid a glove on her. During the post-debate analysis, many of the political commentators accused Trump of a self-inflicted knockout with his reaction to the legitimacy of the election. Yet even excluding that, before it was over he wound up looking like a brawler, while Clinton was content to win on points.